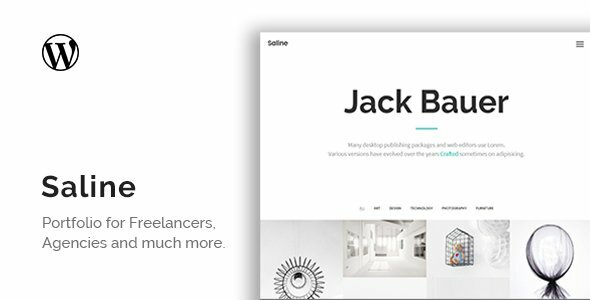 Saline is a Portfolio WordPress Theme built with HTML5 & CSS3. It is perfect for freelancers,portfolio and agency websites. Visual Composer — You can build your own layout in a easy way using the avaible Drag and Drop plugin in a few minutes. Revolution Slider — If you want to give ability to your website to be seen fully touch screen,We absolutely recommend you to use our slider Saline has for you. Advanced Theme Options Panel — You can build your own layout though the use of amazing page builder of our admin pannel. Easy Installation and Demo Data — Saline provides you more simplicities to you as you create new pages,regarding your need.So all you need is to copy your content into the already made template and get the same design. Font Awasome — You are able to select any of the scalable icon Saline has and customize them easly as you wish. Working Contact Form — It is not that harder to create a new form page though the use of the plugins and you can get all messages by your clients as an e-mail as well. Support — We have a professional and decicated support team for your all questions regarding our theme.We try to do our best in respect to serving you by replying your question in a great way and on time.So let us know if you any one.